The Chipper Clipper: Free Thomas the Train Brushing Chart! This is so cute and anyone who knows me and my little guy knows he LOVES Thomas. 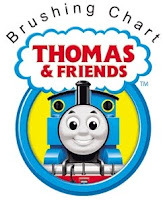 If you would like a Thomas & Friends Brushing Chart to help get your little ones to brush their teeth then just head over here and download and print it from Orajel. There are 2 Thomas trains each day for them to color after they brush. A very cute idea and free!